Donald Trump has made the dubious claim that the noise from industrial wind turbines causes cancer. 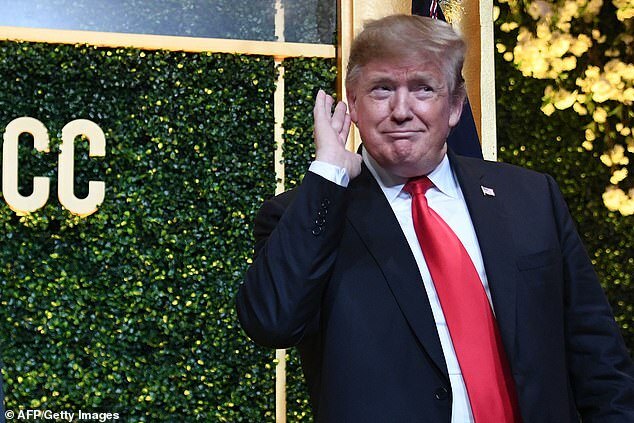 'Hillary wanted to put up wind, wind,' Trump said in wide-ranging remarks at the National Republican Congressional Committee's spring fundraising dinner in Washington DC on Tuesday. Studies have been mixed when it comes to the impact of wind farms on real estate values, with some finding a negative impact on home prices of up to 40 per cent, and others finding little or no impact. 'Exposure to wind turbines does seem to increase the risk of annoyance and self-reported sleep disturbance,' a 2014 review of the literature for PloS One indicated. 'President Genius has a long history fighting to protect people from windmill noise cancer. Just ask the folks that live near his golf course in Scotland,' another jeered, referring to Trump's longstanding opposition to wind turbines off the coast of his Scotland property. Another questioned the sourcing of Trump's information. 'I want someone somewhere to track down 'they'. 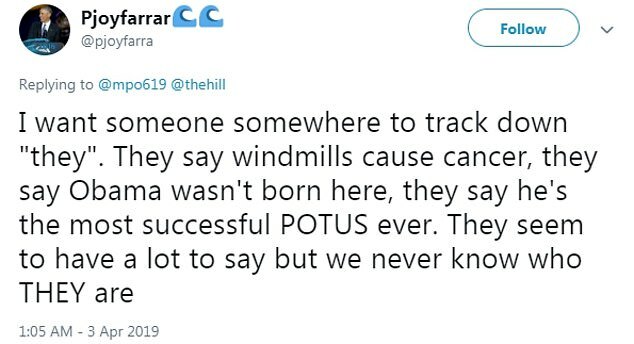 They say windmills cause cancer, they say Obama wasn't born here, they say he's the most successful POTUS ever. They seem to have a lot to say but we never know who THEY are,' he wrote. At another point in his roughly 80-minute remarks, Trump also revisited his odd pet peeve with the Electromagnetic Aircraft Launch System, or EMALS, which is replacing steam-driven catapults on Ford-class aircraft carriers. Trump has griped about the subject repeatedly in the past, voicing his preference for 'reliable' steam. CAN THE NOISE FROM WIND TURBINES CAUSE CANCER? Fears that low-frequency noises – such as those from wind turbines – can be harmful to humans have existed for decades. Protestors of wind turbines cling onto claims that ‘wind turbine syndrome’ is real, despite there being no hard evidence it exists. They claim the noise the environmentally-friendly energy sources emit can lead to nausea, sleep loss, fatigue and anxiety. And, some even go as far to claim that the constant sound can cause cancer. Though, scientists remain dubious as no study has ever found firm proof of such a link. Simon Chapman, a professor of public health at Sydney University, claimed there had been 17 reviews of the evidence of harm caused by wind farms. And he argued, in a piece for The Conversation, that 'that there is no strong evidence that they make people ill'. Dr Nina Pierpont, a New York paediatrician, conducted a study a decade ago that looked at 10 families living near wind turbines. It suggested that living too close to wind turbines may lead to heart disease, tinnitus, vertigo, migraines and even sleep deprivation. However, critics hit back at how the study was carried out, and argued that it ‘provides no conclusive evidence’.